THOR uses a single power source, removing the risk of power loss at critical moments. This has also enabled a new lightweight NVG to be designed, which removes the need for a counterweight at the back of the headgear, eliminating the risk of physical stress and pain in the soldier’s neck. Tomorrow’s soldiers will not only rely on the latest weapons and protective body armour to give them the upper hand on future battlefields, but also on the latest communications and connectivity technologies, that will keep them – and all of the sensors and devices they carry – connected and networked with their command and control elements. Whether mounted, or dismounted, this connectivity will impart both tactical and strategic advantage for those using the latest, most effective technology. Connectivity for tomorrow’s soldiers will be imperative and one of the most important equipment systems they’ll rely on will be advanced headgear that acts as a nexus of integrated systems with a communications component aimed at keeping each mounted, or dismounted, soldier ‘connected’ to the battle around them at all times. As well as their comms tech, their headgear will need to provide a support platform and connectivity with night vision, electro-optical devices, cameras, situational awareness tech, all of which will need to interoperate in total harmony. Each man will become a C3I/C4I hub, all of his own. Inside an APC or AFV, such future headgear will connect each soldier into the vehicle C3/intercom architecture, interoperating as a unified system. It will provide communications both inside the vehicle, as well as to the outside wider tactical radio network, so the soldier remains in contact for voice and data at any stage. As the hub for a soldier’s installed sub-systems, an effective integrated headgear system will link into the platform-based C3 system of an APC, AFV, B-vehicle or marine vessels such as RIBs, inshore patrol boats or landing craft, ideally via a soldier’s own personal control unit (PCU). This unit will ‘sit’ on the chest or shoulder of the soldier’s equipment harness and connect the headgear of each of the crew and mounted troops into the vehicle’s onboard radios and intercom via distributed connection points throughout the platform. Beyond the vehicle, the headgear and PCU on their own will be capable of routing audio communications, as well as data from all kinds of sensors, such as shoulder-mounted cameras or NVGs. One of the most important equipment systems tomorrow’s soldiers will rely on for connectivity on the battlefield will be advanced tactical headgear, with a communications component aimed at keeping each mounted, or dismounted, soldier ‘connected’ to the battle around them at all times. 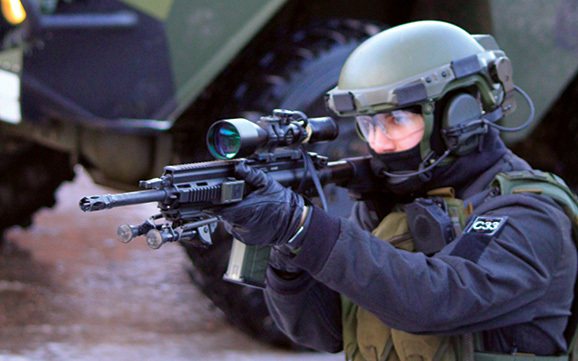 In Finland, the Finnish Defence Forces’ (FDF) Warrior 2020 programme has adopted a combat helmet system with the attributes mentioned. The programme itself, aimed at meeting the needs of all arms of the FDF, is said to be one of the most advanced of its kind in the world. One reason for this being its ‘relatively late start’, which has given the FDF and its Finnish defence industry partners the opportunity to look carefully at all other similar programmes already underway. The integrated headgear system adopted under the programme is the THOR Tactical Headgear system for changing Operational Requirements, which has been developed by prime contractor, Savox Communications, along with its consortium partners, Millog and FY-Composites. This totally new system has set the integration of all its elements as a crucial design rule from the start, with each item, from communications, hearing protection, night vision and ballistic protection, designed specifically to integrate and interoperate perfectly with every other sensor and headgear sub-system from the outset. THOR uses a single power source to run its embedded technology, removing the risk of power loss at critical moments and eliminating the need for numerous spare batteries to be carried. 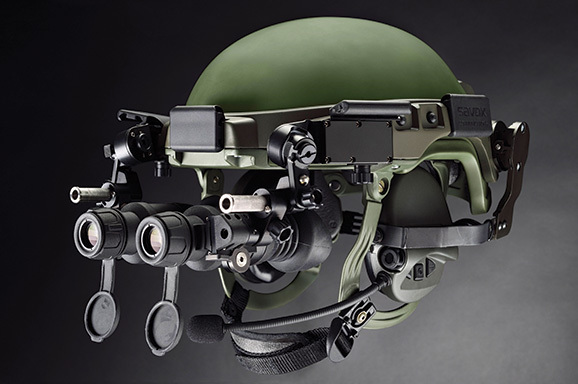 This single-source power supply has also enabled a new lightweight NVG to be designed for the system, which removes the need for a counterweight at the back of the headgear, eliminating the risk of physical stress and pain in the soldier’s neck. THOR has now entered mass production. Mounted troops in a vehicle using THOR can connect a PCU to their headset, which, in turn, connects into the vehicle C3 system via distributed universal ports situated at key points inside the platform. Such is the case with the Savox IMP command, control and communications system that integrates intercom, radio control and a common core platform for voice and high-speed data distribution around the vehicle. 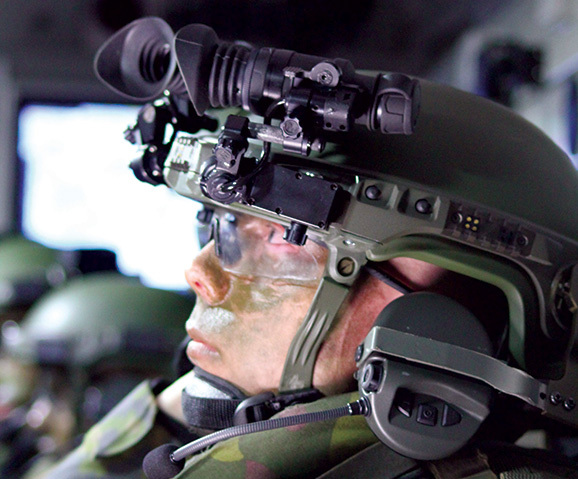 An integrated helmet system, like THOR, in combination with the control units and capabilities of an onboard C3 system, like IMP, without doubt, offers exceptional connectivity for the individual soldier. However, with the battlefield environment evolving all the time and the use of so many communications systems, sensors and devices all gathering tactical information that needs to be shared, an additional, complementary communications element is emerging to enhance a soldier’s capability of coping with all this traffic even further. The new concept will not only interface with tactical communications systems but is aimed at being able to take advantage of the existence of 3G/4G cellular networks and COTS (commercial off the shelf) technologies to provide even faster data comms to support the high-speed, bandwidth-hungry data demands on tomorrow’s battlefield. The concept of a Soldier Router to provide a platform for voice and data integration, whether mounted, or dismounted, can help simplify the growing variety and demands for voice and data on the battlefield. Such a router would ‘sit’ on a soldier’s back in his harness, requiring no interaction by the soldier while on operations, simply needing to be turned on or off at the start and end of a mission. A harness-integrated PTT switch enables voice communication with commander or others onboard. This type of Solider router could interface with several radio types, from analog audio interfaces , RS-232 serial data ports, to digital IP-capable combat net radios, as well as offering wired or wireless Ethernet access and USB access. With audio in and out, together with wireless local area (Wi-Fi) and personal area (Bluetooth) network functionality, the point of having a router is so that soldiers who find themselves operating increasingly in multi-vendor combat system environments can effectively connect with anything: different radios, old and new, from different vendors. Such a router would also incorporate positioning capabilities such as GPS, so it acts as a positioning device to provide location data to battle management systems for friendly forces tracking purposes, via the radios, or the Internet. A router would mean a soldier wearing integrated headgear, such as THOR, would no longer have to connect via a PCU into a tactical radio, or onboard C3 system, but rather simply into the router on his back. The PCU software would be incorporated into the router’s OS, thereby emulating the PCU, and the onboard C3 system, such as IMP, will connect to the router rather than a PCU. Software-defined, a micro-SD port will enable any necessary modifications, or updates, to be carried out. In a typical mounted scenario, such as the three crew and 10 men being transported by an armoured modular vehicle, who would have a router in this scenario depends on operational needs. Certainly, the vehicle commander and squad leader will have a router each, but if, say, the rest all use personal radios and have a tactical terminal then a router rather than a PCU will be appropriate. Whereas, if they just need communications while mounted and they don’t have personal radios with them or tactical terminals, then it is likely to be just the commander and squad leader to use a router. In the case of SF teams on a covert mission then all would be expected to be equipped with the soldier router, as it offers a way to connect their sensors, devices and equipment, such as cameras and sniper switches to the combat management system at all times. By introducing a soldier router, the combatant will act as the ‘hub’ for everything; and while the router might be used in combination with an integrated headgear system, like THOR, the router can also be used independently, adding a new dimension to individual soldier battlefield communications capabilities.